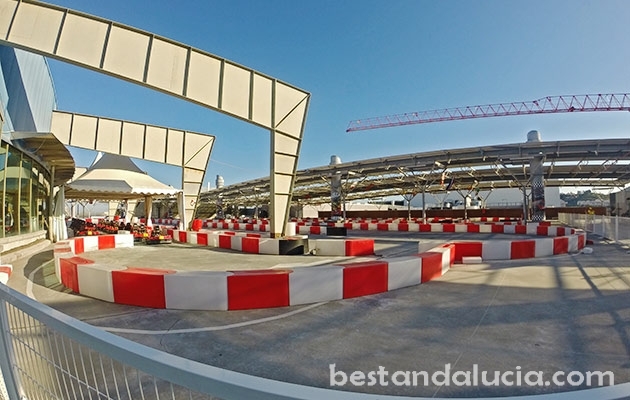 The are different professional karts available there: a kids gokart, a 270 cc, a 390 cc with a maximum speed of 85 km/h. 7-minute session for kids costs 10 Euros, 9 minute-session for adults costs 15 Euros. 15 minutes on a competition track costs 25 minutes and 30 minutes costs 45 euros. The 450 metre and 200 metre long tracks are located on the roof terrace (second floor) of the Miramar shopping centre, just next to Parque Fluvial and Rio de Funegirola. Fuengirola’s racing track is opened from Monday to Sunday from 10 a.m. to 10 p.m. There are karts of very good quality available there, up to 160 cc and maximum speed of 50 km/h. There are gokarts both for adults and kids. The minimum age is 5 years old.